A European Delegation was in the Lao Capital, Vientiane from the 6th to 9th of March 2013 to express their grave concern that Sombath Somphone, highly respected member of Lao civil society, has still not returned safely to his family. Sombath disappeared on the 15th December 2012, taken away in a truck by unknown persons after being stopped by police in Vientiane. Nobody has seen or heard from him since. 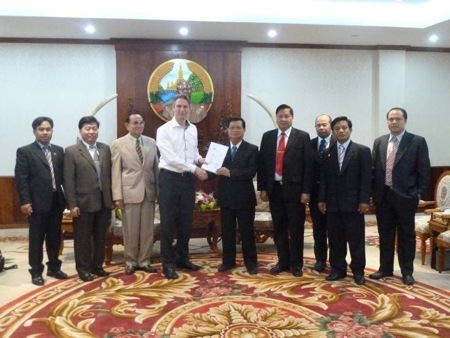 The Delegation formally presented to the Lao National Assembly and the Vice Foreign Minister of the Lao PDR the European Parliament Resolution on ‘Laos: the case of Sombath Somphone’, unanimously adopted on 6th February 2013. Dutch Senator and Delegation leader Tuur Elzinga stressed that the delegation strongly felt that it was within the capacities of the Lao Government to ensure Sombath’s safe return to his family and that it is therefore essential that appropriate actions are prioritised. He also stressed that for every day that passes without Sombath’s safe return to his family, the credibility of Laos weakens. The 8th of March 2012 is the 83rd day since Sombath’s disappearance and for many organisations a 100 days is a time for reflection and taking stock on progress. If no positive result has been achieved a new phase of international activity will inevitably be entered as the European Parliament resolution formally calls on the EU to include Laos and the case of Sombath Somphone in its priorities for forthcoming sessions of the UN Human Rights Council. The year 2012 started a positive year for Laos’ credibility, both nationally and internationally, hosting the ASEM9 Summit and entering the WTO. Unfortunately this credibility is now at stake. Senator Elzinga: ‘If Lao officials think the issue of Sombath’s disappearance will go away, they are wrong. It will be the first item on any agenda in bi-lateral, multi-lateral and international discussions with and about Laos, until Sombath is safely returned to his family’. The full report of the delegation is available here. The Vice President of The National Assembly of the Lao PDR, Mr.Somphanh Phengkhammy and members of the National Assembly including Mr. Onsy Saensouk, Vice Chair of National Assembly Committee for Security and National Defence , Mr. Kisinh Sinphanngam Vice Chair and the National Assembly Law Committee and Mr. Khongsy Sisengdeuane, Deputy Permanent Secretary. Tuur Elzinga, Senator (for the Socialist Party) in the Dutch Parliament and member of the Parliamentary Assembly of the Council of Europe. Elzinga was accompanied by Andy Rutherford, a representative of the International Organising Committee of the Asia Europe People’s Forum (AEPF), who had worked closely with Sombath in the preparations for and organising of the AEPF9 that took place in Vientiane between 16th and 19th October 2012 in the weeks before ASEM9. The Resolution of the European Parliament is available here. Rarely the centre of regional media attention, Laos is more often associated with being “tiny” and “land-locked” but this week the Southeast Asian nation has been forced to perform some diplomatic acrobatics to manage a growing storm around the disappearance of activist Sombath Somphone. Anyone who lives there will know that a safety net is always recommended when Laos walks the diplomatic tightrope. Questions around the disappearance of a much-respected activist and campaigner for sustainable development are coming thick and fast since his abduction on a busy street in the Lao capital of Vientiane. But a more unusual sight for locals and observers is watching the Lao Government crunching through their PR gears.